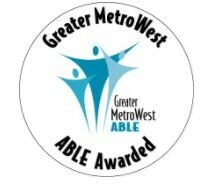 Bnai Keshet has been certified by Greater MetroWest ABLE as a congregation that is accessible to people with a variety of disabilities. We rejoice in the diversity of our congregants and actively welcome persons with disabilities. Please let us know if you need any additional accommodations for our programs or services. 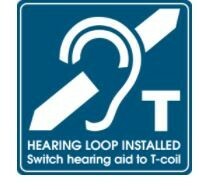 Our Sanctuary is equipped with a T-Coil Hearing Loop. Large-print siddurim are available behind the usher's table in the Lobby. Ramps are available onto the sidewalk behind the Main Building and into the Sunroom of Red Gables from the parking lot. Please note there is a large push-button door opener available at the back door of the Main Building (accessible from the parking lot). Cleaning products and soaps used in both buildings are scent-free. A quiet space is available on the second floor of the Main Building for use by adults or children, and the Childcare Room on the second floor is also available for those who would like to view and hear the service from a smaller room. Fidgets to borrow during services are available in the cabinet in the Coat Closet on the first floor of the Main Building.